Watch the highlights and the domain discussions of the 3Ccar Vision 2016 meeting in Malaga. 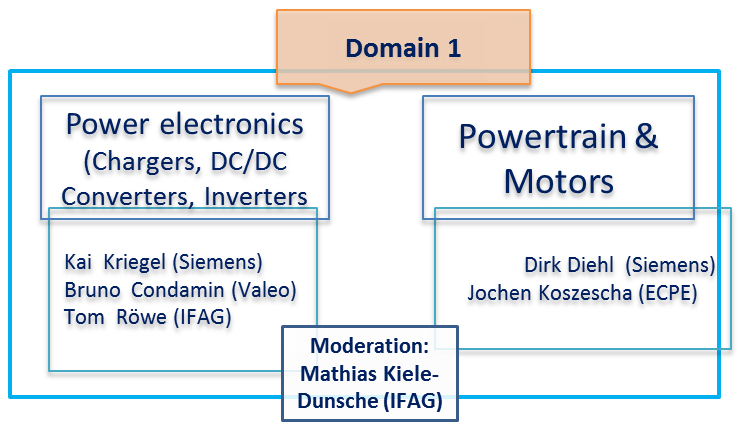 Representatives from Domain 1 started their discussion with a focus on the most pressing challenge for inverter products: power demand within vehicles is increasing – in fact it is at the very limits – and after these limits are crossed, numerous issues will arise. Possible solutions for this important challenge that were discussed were the following: ways to increase the voltage; near-wheel motors; recuperative breaking; power steering; electric suspension; sophisticated cooling systems Challenges and solutions were also discussed with their potential applications in other transport industries like public transportation, agricultural and forestry vehicles, and small aircrafts. A big step on the Heat management and Magnetic circuit problem was the discussion of a virtualisation of the sensors needed everywhere.The future vehicle was envisioned as a system encompassing the shift of control items towards a centralised cloud, with a number crunching unit within the car (the control strategy). In this context, cost-effective security and reliability features were noted as the key aspects to have a fail-safe operation. In the Second Domains discussion the starting theme was a discussion about an improvement of the battery effiency. 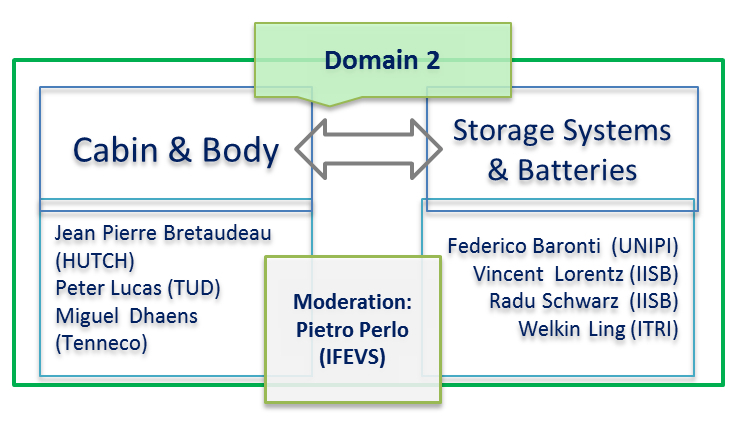 Battery management systems’ challenges: extending the lifetime, determining the state-of-charge and remaining useful life, and ensuring safety (safe operating area and voiding any risk of thermal runaway), with maximal cost-efficiency. One of the conclusions of the discussion was that the performance of the battery pack can be greatly improved and total costs of ownership can be reduced if cell and electronics are produced together. Another Way discussed was the improvement of the recuperation systems that the car could reuse 100% of its energy and the battery would only be used to accelerate the vehicle. New Design possibilities for the body and the Cabin were envisioned. The new cabin and body structure must meet the future demands for lower energy consumption and the changed management of the available space. composite materials could be used to reduce weight and make the cost effective and comfortable. Visions on Car glass research and the use of solar panels and photo organic parts are also parts of the discussion. Representatives from Domain 3 addressed the more philosophical and behavioural aspects of the future vehicles. The consortium believes that the human factor of scepticism can be changed via education and advertisement, and the current trends in both Europe and Asia confirm this belief. Today the social acceptance of EV is on a positive trend. An important challenge is to call forth the users acceptance of the high price of the EV and the benefits of these vehicles. The conclusion of this debate was the both the 3Ccar, and the automotive industry overall, has to make an “offer, which people will like to choose”. 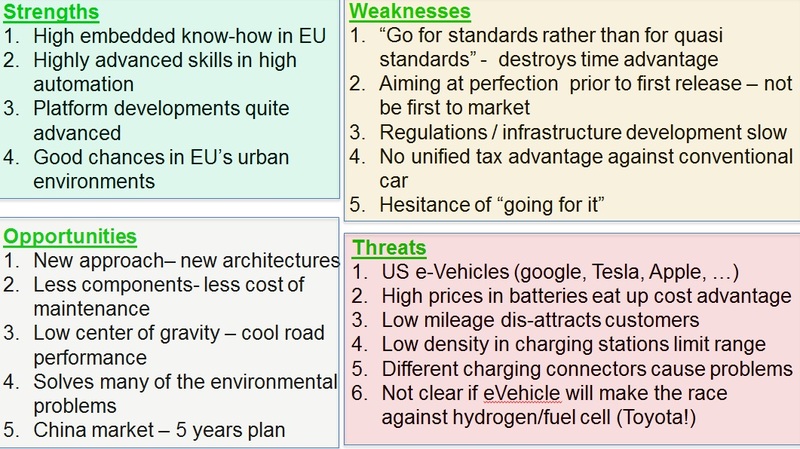 To be widely accepted, the future technology-enhanced electric vehicles have to offer affordable, high technology, high functionality and be from a new kind of industry. 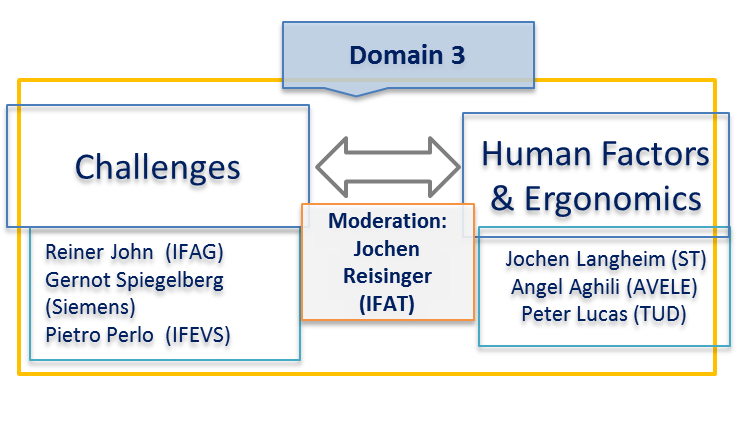 The simulation aspects within the 3Ccar project are seen as a way to unify the domains, which allows a holistic and more unified approach. Simulation helps define a system, benchmark against competitors, foresee the costs, and avert risks. 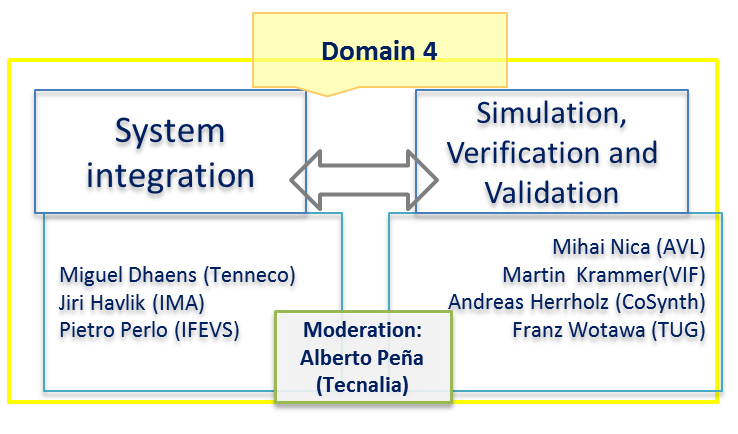 4th domain’s representatives agreed that with the current trend of transport moving from individual vehicles towards cyber-physical systems, holistic approach with detailed simulations (of nearly entire world) is needed. An interesting future perspective was envisioned for perception enhancement and user experience: the automotive industry could team up with the gaming industry, to gain valuable know-how, video and other games have demonstrated the addictive potential of well-designed sensory stimuli and cognitive tasks. To manage the System Integration. The different components of the System have to be looked at and their faultless functioning ensured, before the entire system is put together. Another important aspect of the system integration was the fact that different components of the system must be designed in a way as to not rely on one supplier to prevent monopolisation. The high speed communication’s supply chain follows an evolutional approach for different functionalities of the future vehicle. We are now somewhere between SAE level 3 and 4 and the ADAS System starts to provide functionality in safety relevant applications but the driver still has to take the full responsibility. The following challenges were identified for communications, and partners defined appropriate mitigations as summarized below. 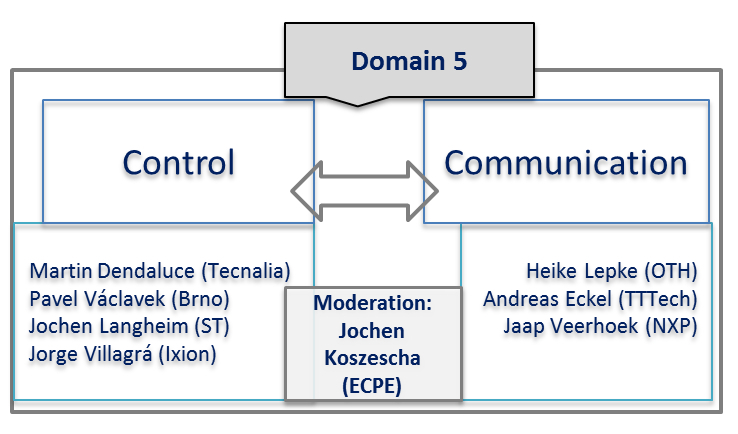 Within the 3Ccar project, the following break through opportunities were introduced: Centralized back-bone architecture implementation; Platform approach as quasi standard accepted in industry; Aerospace ideas in safety architectures successfully adopted for automotive use; Independence of application from integration and communication; Strict partitioning of applications in multi core architectures. Most of the Control platforms are based on a combinaton of microcontrollers with FPGA. But ints neccesary to to take into account the interests of the semiconductor Partners involved in the project. Importance of understanding requirements from other supply chains, but only to a point. First and crucial step: state-of-the-art (very extensive work). Benchmarks and tool-chain follow. Going forward, the 3Ccar consortium wants to build on the momentum of the workshop in bringing together the different domains into a community with one shared vision. For sure, the extended discussions during this workshop were a successful experiment to understand and translate 3Ccar’s vision into its mission and objectives. The detailed and inspirational presentations from the numerous leaders of the 5 domains were an excellent start for discussions, contributing towards an envisioned successful implementation of our 3Ccar project.